You certainly don’t want to forget that important weekly meeting of Electronics Shoppers Anonymous. Rather than enter each of those meetings individually, you can set up a repeating appointment in your Palm’s Date Book. 1. With the Date Book visible, tap the name of the appointment that you want to set up as a repeating appointment. 3. Tap the Repeat box. The Change Repeat dialog box opens, as shown in Figure 1. Figure 1: Y’all come back, now! Set up recurring appointments in the Change Repeat dialog box. 4. Tap one of the interval pattern buttons to set the frequency that you want. Your choices are None, Day, Week, Month, and Year. When you tap one, the screen changes to show intervals that are suitable to your choice. If you choose nothing, your Palm device assumes that you mean None. 5. Enter a number to indicate how often you want the appointment to repeat. If you enter nothing, your Palm device assumes that the number is 1, meaning that the appointment occurs every day, week, month, or year, depending on which frequency you chose. If you change that number to the number 2, your appointment occurs every two days, two weeks, two months, or two years. 6. If your appointment repeats until a certain date, tap the End On box. Some appointments repeat for a certain period of time. If you go to night school, for example, your class may occur once a week for ten weeks. When you tap the End On box, a menu appears, giving you two choices: No End Date and Choose Date. 7. Tap Choose Date from the End On box. The Ending On screen appears. 8. Tap the end date that you want on the calendar on the Ending On screen. The Ending On screen disappears, and the date that you chose appears in the End On box. 9. Tap the appropriate box to indicate other information about your repeating appointment. You have one other choice to make if your appointment repeats on either a weekly or monthly basis. You can set weekly appointments to recur on several days of the week (such as Monday, Wednesday, and Friday) by simply tapping the various days. Notice that the days are set on a toggle — meaning that you must tap them again to deselect them. If you’re setting up a monthly appointment, tap either Day (for example, the third Monday of every month) or Date (for example, the 15th of every month). 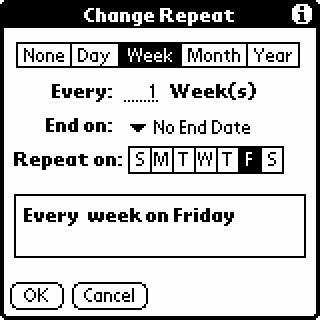 When you make any of these choices, a line of text describing your recurrence pattern (such as “The third Monday of every month”) appears in the box at the bottom of the Change Repeat dialog box. Keep an eye on this text to be sure that you’ve set up your appointment correctly. The Change Repeat dialog box closes, and the Event Details dialog box opens. When you create a repeating appointment, each instance of the appointment looks like a separate item, but the occurrences are all connected in the mind of your Palm device. If you change or delete one occurrence of the appointment, then your Palm device wants to know whether you’re changing every occurrence or just that one. When it asks, just tell it what you want.